There has been a general increase in permafrost temperatures during the last several decades in Alaska, northwest Canada, Siberia, and northern Europe. 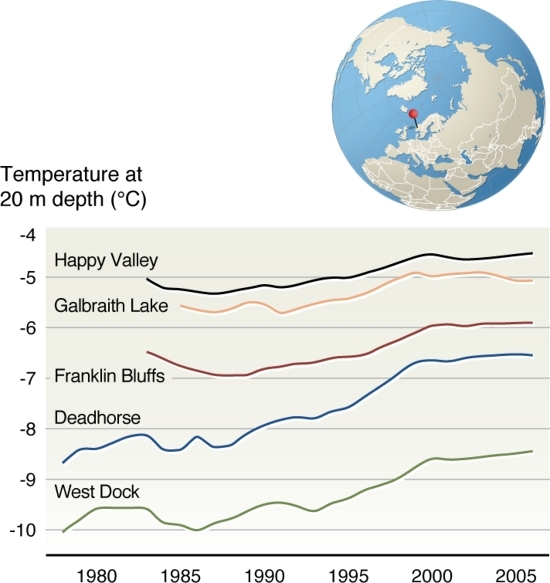 Permafrost temperature records have been obtained uninterrupted for more than 20 years along the International Geosphere-Biosphere Programme Alaskan transect, which spans the entire continuous permafrost zone in the Alaskan Arctic. 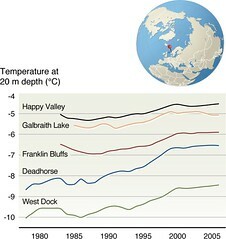 Records from all locations along the transect show a substantial warming during this period. The permafrost typically warmed by 0.5 to 2°C, depending on location (see figure, temperatures are measured at 20 m depth, where there is no seasonal variation).